I did receive 2 Teaching Textbooks 3.0 subscriptions for my children. I also work for Teaching Textbooks as their social media manager. However, all opinions are 100% my own are were not changed because I received review copies or work for Teaching Textbooks. 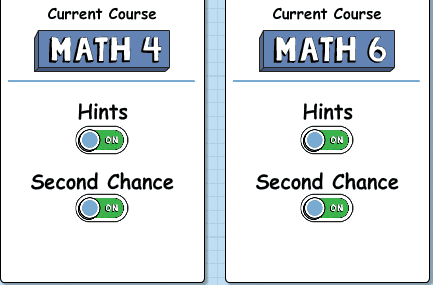 Have you been trying to pick a math curriculum? I know that choosing the right math can get stressful because there are so many variables to consider. When I found out Teaching Textbooks would be offering an updated online version called 3.0 I knew I had to try it. I want to share an honest Teaching Textbooks 3.0 review with you. I have a feeling you are going to fall in love with this new version that is online. I discovered Teaching Textbooks at a homeschool convention a few years ago. R was really struggling with her math curriculum and I had to find something that she could work from that wouldn’t leave her stressed out and me overwhelmed. Because I work from home and have a child with dyslexia, I really needed something that could handle the teaching and the grading. I needed to have a support role in math instead of a teaching role. Teaching Textbooks offered me that in a beautiful format. Now they have updated it and they have simplified our lives even more. We are definitely a Teaching Textbooks family. How is Teaching Textbooks 3.0 helping this work at home mom? I always thought I had the best of the best with the physical products of the Teaching Textbooks 2.0. Then I saw all these new features in the 3.0 and I think I’m in love. I don’t have to be where the kids are in order to look at their grade books or modify things on the parent side. Sometimes I am working on my laptop for my job. Instead of getting up and going to their computer, I can simply log in to the parent side of the curriculum and delete problems or an entire lesson. Not a Replacement for 2.0, an addition! If you are worried about losing the ability to buy the 2.0 version with the discs and textbooks please don’t. Teaching Textbooks will still sell those. Instead, the 3.0 is a new version that happens to be online. With the 3.0 you will get better audio quality and additional features but the educational value will still be completely equal to the 2.0. In fact, you can use the books from the 2.0 version with the 3.0 version. My daughter is a perfectionist. Seeing anything less than a 100 on an assignment drives her crazy. Instead of it becoming an issue, we simply go in, delete those problems, and give her another chance to work them again. It also lets me see how many times she attempted a lesson and if she used any hints. This is great if she is working independently and I need to be able to adjust things or check on what she is accomplishing. If your computer crashes, you lose all of your grade information. If you live in a state where you have to provide this to the state, that can be a big issue. With the 3.0 you can have your grades stored online. This means grades are accessible from anywhere you have an internet connection. Even if your computer goes down, you will have access to these grades. One of the things I love about Teaching Textbooks is that even if you don’t keep your subscription, they will continue to store those grades for you. High-Quality Customer Service and Tutoring! We rarely have a need for customer service but when we do, I am always able to call and speak directly to an actual person who is very knowledgeable. Another huge perk for me is the free tutoring. Through the customer service line, you can set up a conversation with a tutor who will help your child with an area they are struggling with. This is such a great option as it saves money and time. I don’t have to leave the house to meet with a tutor. 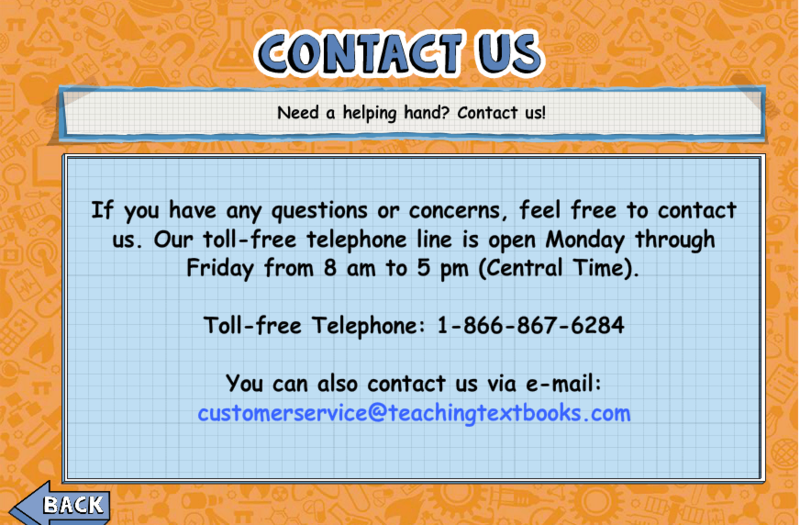 If one is needed, I can call and set up something with Teaching Textbooks. I know this may seem small for some but this has been huge for us. I only wish it would have been available when we had our house fire. There is just something so fantastic about the ability to work on different computers, in a different location, or when you lose/damage a disc. We have had a few damaged discs in our past and while I am thankful Teaching Textbooks replaces them for $15 I would prefer to not worry about replacing them or installing on new computers. This is also a great option as many computers no longer have disc drives or update their systems to things that may not be conducive to the discs. With the online version, this is not an issue. All lessons are read to the student. This has not changed. If you have a child with dyslexia or a reading difficulty the 3.0 will still include this feature. Having the lessons, problems, and hints read aloud was a great help for my daughter when she was younger and struggled more with reading. Sometimes kids just need a bit of help when working on a problem. 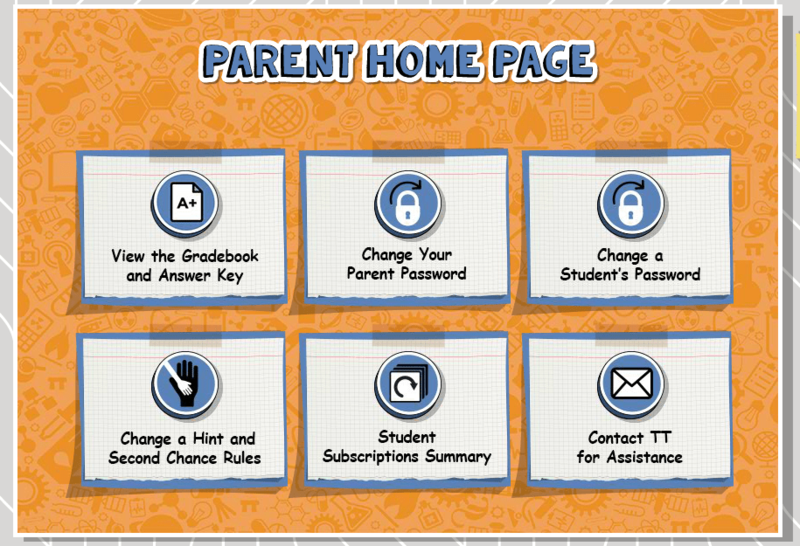 With the hints feature, your child can ask for a hint to help jog their memory. These won’t answer the question for them but they will give them a hint to help them keep working. What about the new features? Do you have a child who relies too heavily on hints and second chances? On the parent setting sides of things, you can turn off either of these to have the learning experience you want. This extra layer of customization is just awesome! You really can create the education you want your child to have. With the subscription to the 3.0 you will also receive access to the ebook version of the text. This is fantastic if you have a child who prefers to read thru the text instead of listening to the video lectures or in addition to listening to the video lectures. Within the ebook students have the ability to read through certain lessons, highlight areas of focus, and see the problems for the assignment. As a parent, this is a great place to get a general overview of the lesson and what questions your child will be responsible for answering. This can be a really helpful option if you have a student who you know struggles in a certain area and may need additional help. Knowing what is coming in the lesson plan can help you to move ahead. Example of purchase link for the physical textbook. The Teaching Textbooks has a link like this at the bottom of every level for you to buy the physical textbook. Do you still want a physical book? You can purchase the 2.0 book and it will still work with the 3.0. I know this can be helpful if you have a child with dyslexia or dysgraphia that struggles with accurately writing down the problems. You will go to the level you need on the Teaching Textbooks website. Scroll past the 3.0 information to the 2.0 information and click on “I just want to purchase the Text and Answer key test bank.” You will pay an additional amount for the physical book. My kids love the Teaching Textbooks buddies in every lesson. The 3.0 has added new buddies and wallpapers the children can change. This is a lot of fun for them because they are able to customize their user experience. My daughter said that she loves that she can go to settings and choose her buddies and wallpaper for her lesson. Each buddy offers different encouragement throughout the process. The buddies are a really fun way to take a lesson that might be difficult and add a touch of fun. Will Teaching Textbooks 3.0 work on mobile? The answer is a definitive “Yes!” Of course, we think the user experience is best on a normal home computer because of its larger screen size, but for those who want/need to use TT on the go or to free up more computers within the home, check out this guide we put together for how to get the best UX on mobile. 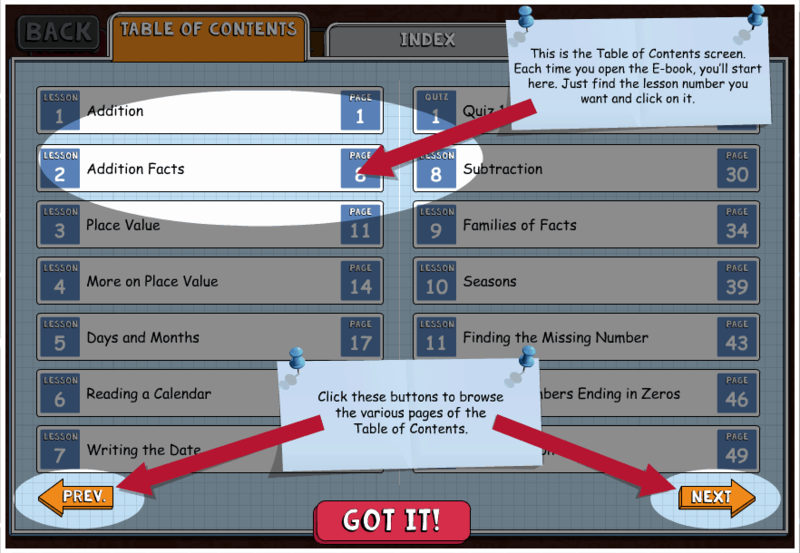 What is your favorite thing about the Teaching Textbooks 3.0 version? R: I love the fact that you can easily pick your buddies without having to click through each one. C: I like that you can still do bonus rounds. Which buddy is your favorite? What is your favorite thing about Teaching Textbooks math lessons? R: I love that I get second chances. C: I like the way that it is taught and it is different from how I had to learn in school. Check out this video review and preview I did on my Facebook page. Do you want to try Teaching Textbooks 3.0 for free? Now…If your feeling like the new TT is something you need to check out, I have some really good news for you. Teaching Textbooks has agreed to provide a free trial for all my followers. With the free trial, you will be able to try the first 15 lessons of any level of Teaching Textbooks—and yes, more than one level is allowed—before buying! Just click on the graphic below to go to their free trial sign up page. The process only takes a second or two. Learn more about the free trial in their FAQS. Go to teaching textbooks 3.0 login once set up. 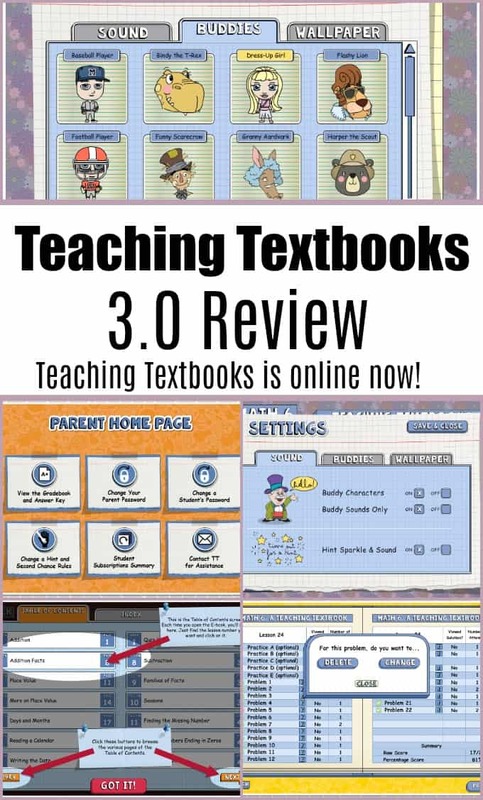 I will be updating this section with Teaching Textbooks 3.0 reviews from some great bloggers. For now, let me share some great reviews from the bloggers who have reviewed the 2.0. I like the permanent grade storage! Great idea! We are considering switching to TT, but there are a lot of online reviews (granted most of them old and referring to 1.0 or 2.0) that say that TT is behind and doesn’t adequately prepare students for the SAT. Is the 3.0 the same material and is it true that the material is really one grade level behind and not as thorough? We generally take the placement test and do it that way. It is easier to look at it as not grade levels but math levels.